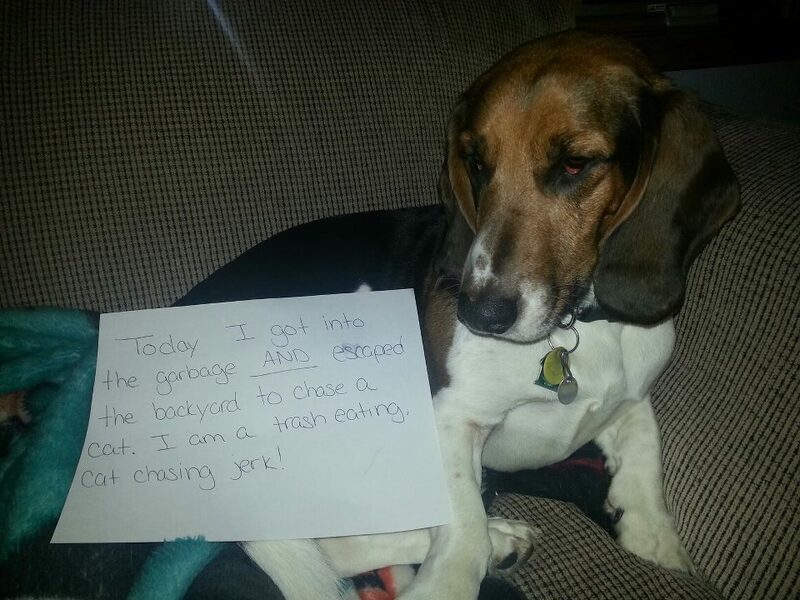 Today I got into the garbage AND escaped the backyard to chase a cat. I am a trash eating, cat chasing jerk! Posted February 26th, 2013 . You’re not a jerk, you’re a hound dog. And those two things are what hound dogs do best! Nothing wrong with chasing cats! One more and it’s a hat trick. Love the smug look. It’s also sad when people don’t understand that it’s all done in good humor, and that these people really love their pets. Oh, and dogs can’t read. i know right lol?!? this site is dedicated to laughing about your pets escapades! Please post the hat trick! I used to call my basset “jackass” all the time-with love. Then one night I went to let him in and said “what are you doing jackass” and our neighbor thought I was talking to him. Oops!